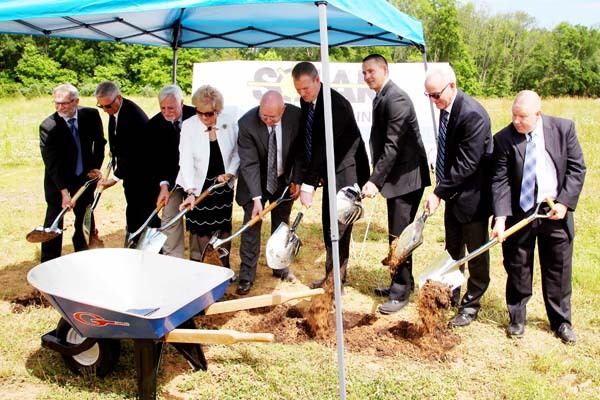 Executives of Solar Manufacturing break ground on a new manufacturing facility at the Sellersville Business Campus in Sellersville, Bucks County, Pa. Photo courtesy of Solar Manufacturing. SELLERSVILLE, Pa.—Solar Manufacturing, Inc. recently broke ground on a new $8 million manufacturing and office facility at the Sellersville Business Campus in Sellersville, Bucks County, Pennsylvania. Due to substantial growth in recent years, Solar Manufacturing expanded into two separate manufacturing facilities a few miles apart. The new property will allow the 15-year-old company to combine its nearly 50 employees under one roof, for more efficient production, and triple its current space. Gorski Engineering, of Collegeville, Pennsylvania, is the general contractor. The nearly 60,000-square-foot building on 8.55 acres is scheduled for completion in early 2019. The new building will contain two stories of office space of nearly 20,000 square feet, plus 40,000 square feet of crane-served manufacturing space. Solar Manufacturing (www.solarmfg.com) is a member of the Solar Atmospheres family of companies. Solar Atmospheres, a commercial heat treater with headquarters in Souderton Pennsylvania, has four U.S. facilities with more than 60 vacuum furnaces in operation. Sellersville Business Campus consists of 44 acres located in the heart of Sellersville Borough. Bucks County purchased the land from Ametek with financing provided from the Commonwealth of Pennsylvania. The brownfield redevelopment project is reported to be the first of its kind in the county to be offered by the Bucks County Industrial Development Authority. State, county, and borough agencies worked together to offer the real estate for industrial development.